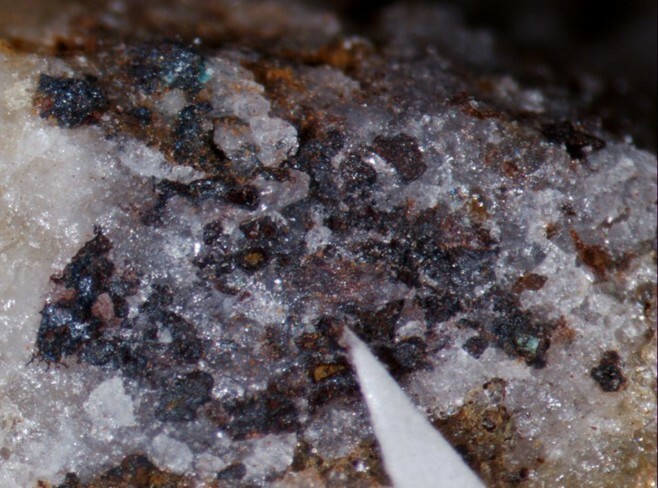 Yarrowite: Mineral information, data and localities. "Extended" formula is Cu+20Cu2+7(S2)7S10 (Goble, 1985). Named after its discovery locality, Yarrow Creek and Spionkop Creek Valley, Alberta, Canada. 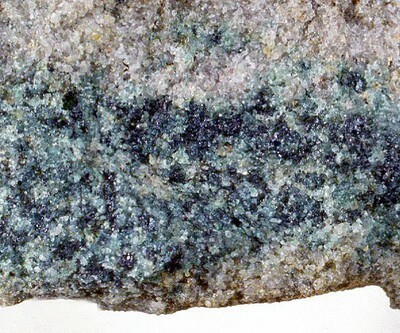 See also the closely related spionkopite. Quartz 8 photos of Yarrowite associated with Quartz on mindat.org. Djurleite 6 photos of Yarrowite associated with Djurleite on mindat.org. Spionkopite 5 photos of Yarrowite associated with Spionkopite on mindat.org. Chalcocite 4 photos of Yarrowite associated with Chalcocite on mindat.org. Wooldridgeite 2 photos of Yarrowite associated with Wooldridgeite on mindat.org. Calcite 2 photos of Yarrowite associated with Calcite on mindat.org. Hematite 2 photos of Yarrowite associated with Hematite on mindat.org. Roxbyite 1 photo of Yarrowite associated with Roxbyite on mindat.org. 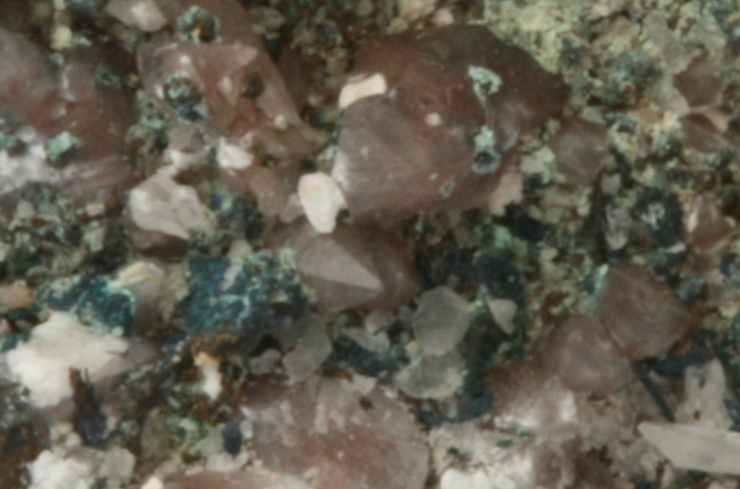 GOBLE, R.J. (1980): Copper sulfides from Alberta: yarrowite Cu9S8 and spionkopite Cu39S28. Canadian Mineralogist 18, 511-518. GOBLE, R.J. (1985): The relationship between crystal structure, bonding and cell dimensions in the copper sulfides. Canadian Mineralogist 23, 61-76. Sabina, A.P. (2015) Rocks and minerals for the collector: Bay of Fundy, New Brunswick and Nova Scotia; South Shore, Nova Scotia. Geological Survey of Canada, Popular Geoscience 97: 456 pages, doi:10.4095/293933 ; Sabina, A.P. (2015) Rocks and minerals for the collector: Bay of Fundy, New Brunswick and Nova Scotia; South Shore, Nova Scotia. Geological Survey of Canada, Popular Geoscience 97: 456 pages, doi:10.4095/293933. - Hyrsl, J. & Korbel, P. (2009): Tschechien & Slowakei, Mineralien und Fundstellen. Page 71. Matsubara et al (2002) Journal of Mineralogical and Petrological Sciences, 97, 177-184. Matsubara, S. et al (2002) Journal of Mineralogical and Petrological Sciences, 97, 177-184.; Matsubara, S., Miyawaki, R., Kurosawa, M., & Suzuki, Y. (2002). Potassicleakeite, a New Amphibole from the Tanohata Mine, Iwate Prefecture, Japan. Journal of mineralogical and petrological sciences, 97(4), 177-184. Anthony, J.W., et al (1995), Mineralogy of Arizona, 3rd.ed. : 428; Graeme, R. (1993), Bisbee revisited, Min.Rec. : 24: 421-436. Boggs, R.C. (1984) Mineralogy and geochemistry of the Golden Horn batholith, northern Cascades, Washington. PhD thesis University of California, Santa Barbara.